After a successful shoot in the blue hour from the eastern overlook of Positano, I decided to go back to the same location for sunrise photos the next morning. The early backlighting from the sun behind cast a really nice light over the township, lighting the surrounding mountains up with a beautiful golden hue, and bringing out the details in the various pastel coloured buildings built up and down the town’s hills. This differentials of colours were accentuated with the use of a Lee Filters GND filter and polarising filter, with some slight enhancement done in my favourite photo editing software, Luminar. Lesson here, even when you have a good shot from a location don’t be afraid to go back at different times to really explore the location and the image possibilities. One of the many gorgeous townships on Italy’s Amalfi Coast is Atrani, a village literally 10 minutes by foot from Amalfi. Atrani is a pretty town cutting into another gap in the coastal mountain range, quickly rising up from sea level to the heights above. Our day trip to Amalfi and Atrani (from our base at Positano) was literally from morning until about 6:30pm. With the early sunset in our low season visit this was actually plenty of time. After arriving in Amalfi we walked straight to Atrani to find a shooting spot1. We found this spot, and then walked back to Amalfi for a visit to the Basilica, some lunch2 and a visit to the paper mill. We then walked back to Atrani to shoot sunset and blue hour, before walking back once more to Amalfi to catch the bus. So we had a pleasant day of exploration, and getting the scouting out of the way early, using tools like The Photographer’s Ephemeris to plan sun angles, meant we could relax and take our time. Travel photography is about exploring, but it is also about relaxing. Good planning and preparation allows you to do both! Apart from the lack of crowds, one of the distinctive things about low season in Positano is that the days are quite short. But it does make it easier when the sunrises and sunsets are at pleasant hours of the day. There are no excuses! Standing on the western end of the main Positano beach, you look eastward down the Amalfi Coast to catch the sunrise. The clouds only accentuate the beautiful colours of the sky in the sunrise. A 3 stop GND and a relatively slow shutter speed meant that a tripod was an important part of ensuring a sharp image. The classic view of Positano is from the outlook at the eastern end of the township, near the Sponda bus-stop. This view is very oft the first stop for photographers visiting Positano1. This is exactly why its a good idea to sometimes shoot the opposite view, so after watching Elia Locardi‘s Photographing the World part 3 I decided to set out to find the overlook Elia used for an alternative blue hour location. This location looks eastward, so I shot it at both sunrise and sunset. Interestingly I really found the location to be better suited to sunset, perhaps a bit surprising, but the blue hour from this location was quite spectacular. For me, the clear blue sky in this image works beautifully with the lights of the town. Visiting Positano in the low season had many advantages, but there were far fewer lights coming on. Its possible that in high season there might actually be too much ambient light, so it would be interesting to see a comparison. This location was perfect for framing the dome of the church in such a way that it has clear sea behind. Tracking this location down was a good opportunity to get an insight into the thinking of a photographer like Elia. It was simultaneously a chance to learn scouting techniques, while exploring and being rewarded with a good photo location. 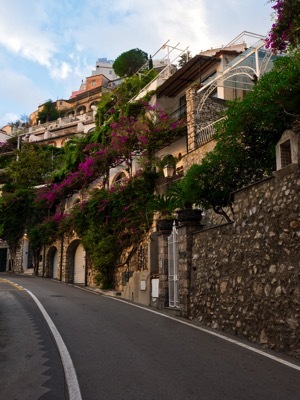 Positano is known for many things – beaches, restaurants, bars, walks, magnificent scenery and more. Perhaps however it is most known for its many, many stairs. 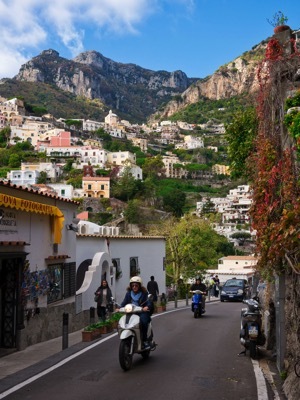 The town really has only two roads – the main highway the winds between Sorrento and Amalfi that cuts through the high part of town, and a second road that winds down from the main road near Chiesa Nueva (New Church) and rejoins the main road near the Sponda bus stop. Footpaths on these roads are limited, to say the least. Getting around town, from the heights down to the beach is generally done on foot and by the many stairways. Shooting these stairways can be challenging as the light range can be quite broad. Shooting early or late in the day, or on an overcast day, can help. This image was made in the morning, and was framed to accentuate the winding stairway, and to use a slightly downward angle to emphasise the nearest stairs, and to crop out the brightest parts of the scene. 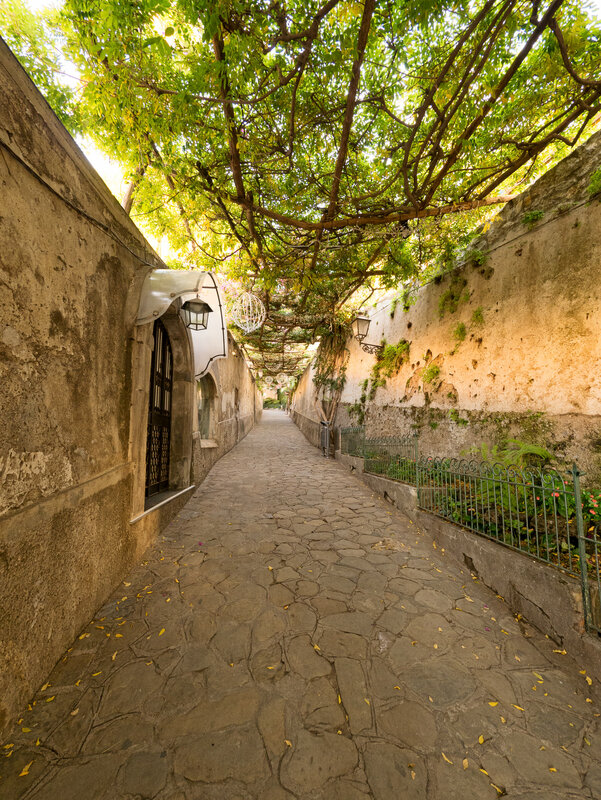 Positano’s stairways are part of this township’s story, and are worth exploring, photographically. View this image on 500px. Positano on Italy’s Amalfi Coast is a spectacularly stunning township, rising up from the sea into the heights of the surrounding mountains. We visited in late Autumn, the low season for tourism, and we loved the fact that we could truly explore the coast, and the whole township without having to battle any crowds whatsoever. This image was made during the blue hour, shortly after sunset. Being winter sunset was quite early (4:39pm), and the blue ‘hour’ quite short – about half an hour. This short window meant that we had to scout1 early, then come back and setup early. Even though it was off season, there were some other photographers around and there are limited vantage points due to the cliff edges and narrow footpaths. Positano is a wonderful place for photographers and non-photographers who want to explore a stunning coastline. I’ve been a bit slack (not the first time) in regularly posting photos. Our recent Italy trip produced a lot of images, and I still have a few more I want to share from our Singapore trip earlier this year. So with some luck there should be some more regular posting of photos.